In the first clash between the two underdogs of the GoMo campaign there’s everything to play for as they meet in the desert. 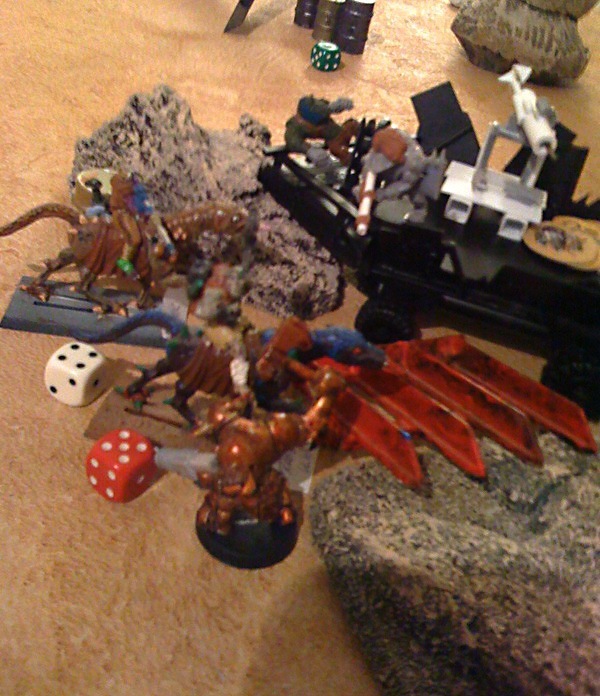 Da Cuttas Ov Da Jibb (recently renamed for clarity) are attempting to haul their looted/stolen/found booty back to Mektown only to be attacked by Da Skid’s mounted menace, The Questers of Magod. 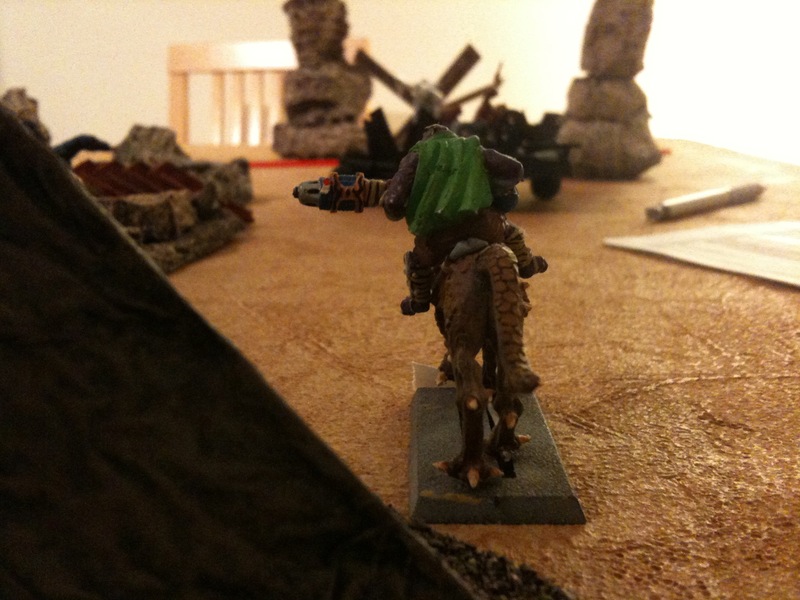 So, who will win – pirate orks or mutant cowboys? Here’s the setup, with muties indicated by the yellow arrows. 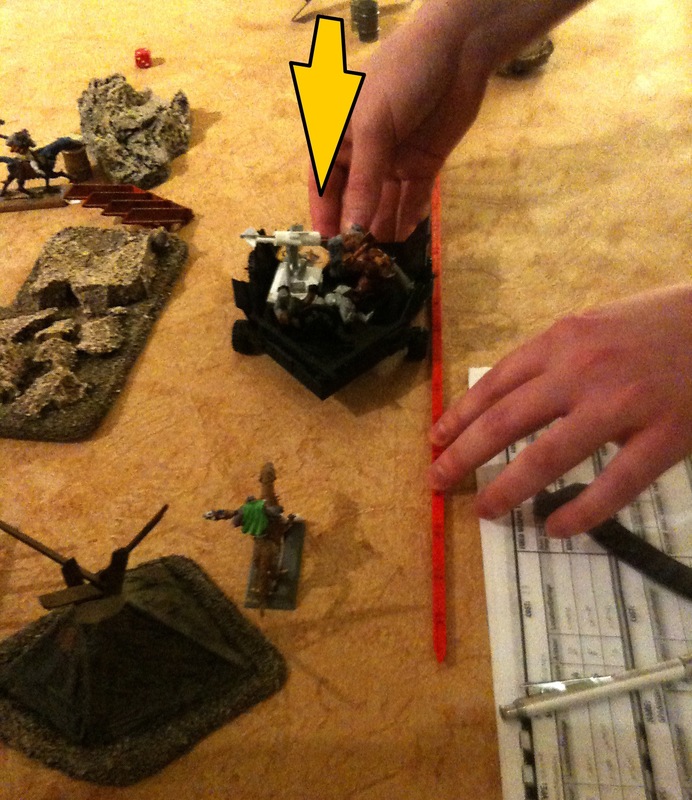 The freeboota trukk is in the centre, indicated by the red measuring ruler. They’re carrying three pieces of scrap and a skeleton crew. They take the first turn, seeing the muties closing in. Attempting to get into a better position for escape the orks get themselves onto the safer side of the difficult terrain and barricades – better one mutie than three, right lads? 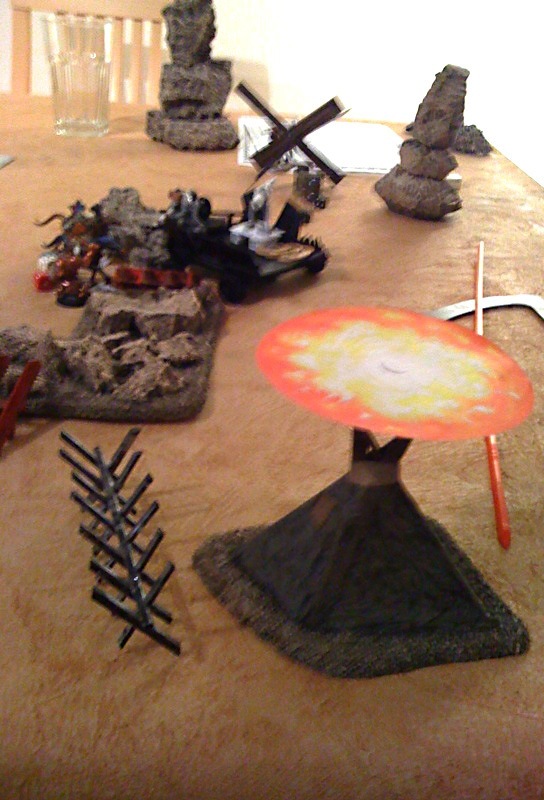 Roja mans the harpoons and goes for the mutie with the huge plasma staff thingy (a Jezzail) but the trukk’s a boneshaker and his shot misses, impaling the nearby tent. Wabdash has better luck and manages to give him a flesh wound but Commissar Statistix isn’t going down without a fight, clearly. Not to be left empty handed the muties close the gap while their heavy support, Commissar Statistix, holds steady, planning his shot. 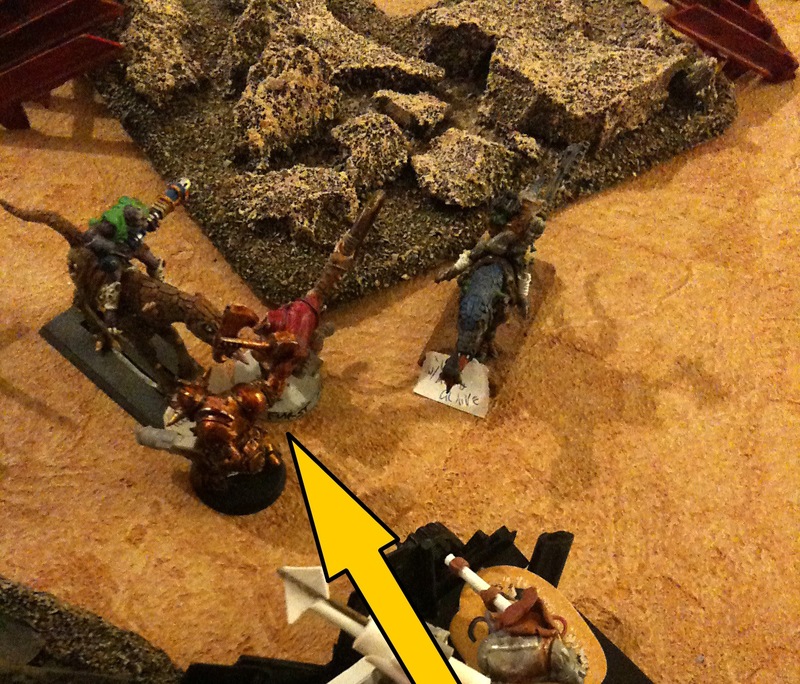 When the time is just right he takes his shot, damaging the harpoon gun onboard Da Jolly Squig. 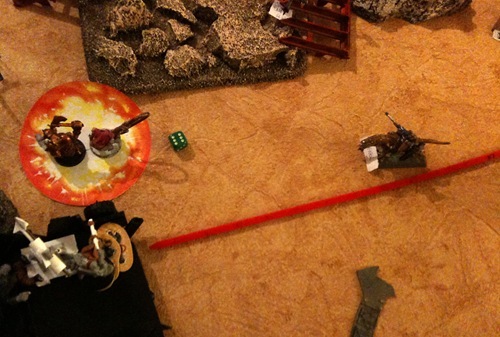 The damage isn’t extensive but it should make it even harder for the freebootaz to use their best ranged weapon. 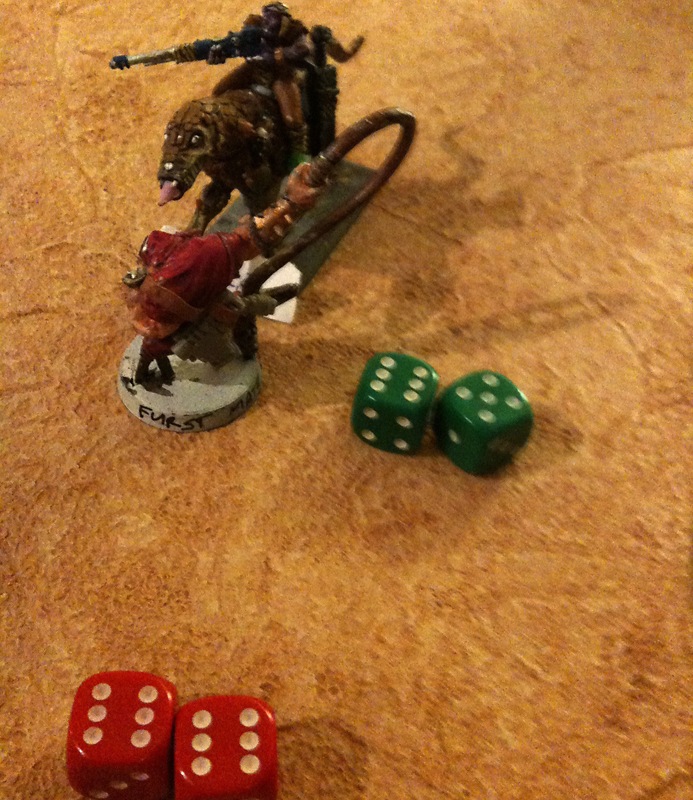 Da Cuttas Ov Da Jibb grin as their driver guns Da Jolly Squig’s engine and tries to make street pizza of Commissar Statistix, who passes his initiative test easily and deftly dodges. 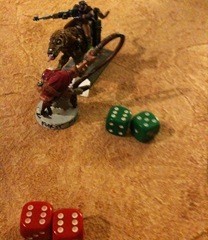 Da Kaptin wants his revenge though and puts the mutie down with a lucky shot from his shoota. 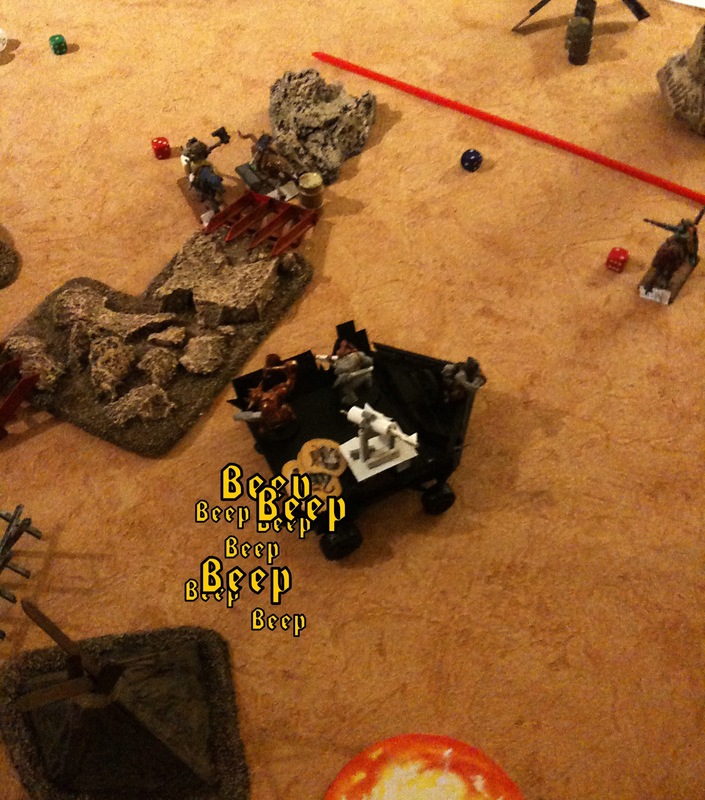 The muties pull it together though and get into range and open fire and damage Da Jolly Squig’s wheels, shaking up the crew but not scaring them off. Immobilise their transport, brothers, they must not escape!" Covered by hail of harpoons and kannon fire from the crew the landing party disembark, charging towards the nearest mutie, Commissar Statistix. 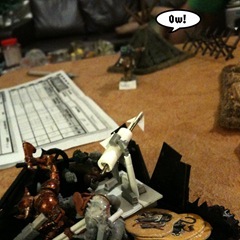 Using their recently acquired growler squigs they take the Keeper down, ouch! 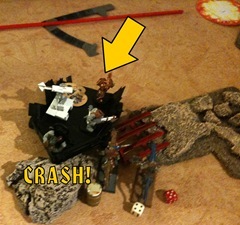 Their trukk is now temporarily immobilised as the driver was one of the crew who disembarked (represented by the model “Grob”). The muties have got the mob where they want them now, but can they claim the upper hand? 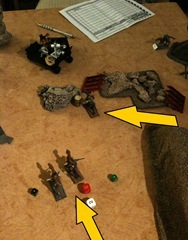 The muties open fire on the landing party as best they can but it’s no good, Steerrraaagh! and Da Kaptin are too gnarly. 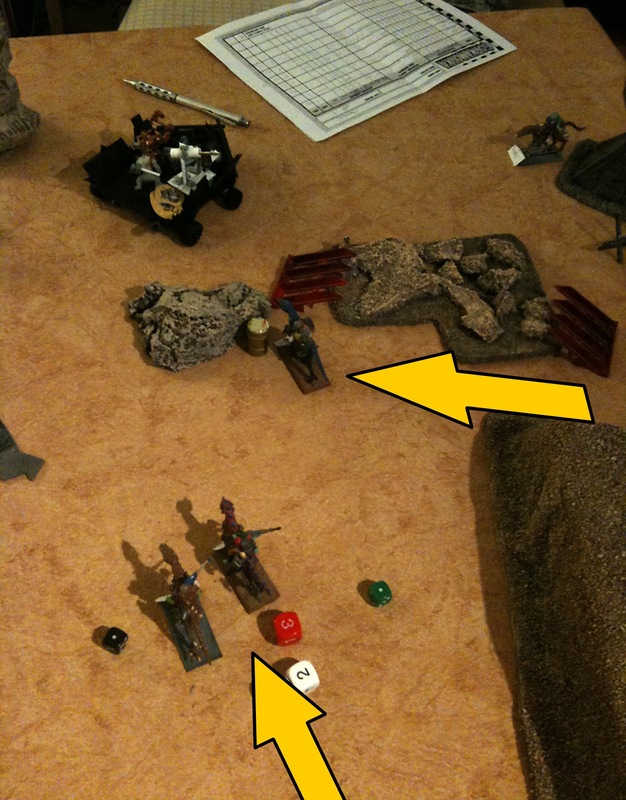 An explosion from Magnus’ fusil hits the freeboota leader full in the chest but once the smoke clears and the echoes die away all that can be heard is the taunting laughter of Da Kaptin. Yarrharrrharr! DAT ALL YE GOT, YER PANZIES?! Steerrraaagh! charges Magnus, the mutie Seeker, and gets in two powerful blows but it’s no good, his armour is just too tough and it’s not long until skill prevails and the ork goes out of action. One casualty each! Meanwhile one of the mutie Snagas is getting into some cover nearby and taking shots at Da Kaptin, eventually giving him a fleshwound, no armour protecting him from that. Taking the hint, Da Kaptin boards Da Jolly Squig again and yells at the gunner to grab the wheel. After a few slow speed manoeuvres they’re eventually back to facing a useful direction – time to squish some mutie scum! While they’re doing that they’re having some issues, mainly because Baccus is dodging between the rock spires in the distance taking potshots at them. That hit-and-run riding skill he’s got is proving very handy. Unfortunately for the freebootaz, they’re about to find out why the gunner is just that.. Firing up the thrusters it’s only a few seconds before there’s an almighty crunch of tortured metal. Well, that’s the thrusters gone. Arrr! We’ve run aground, Cap’n! The muties rain fire on the stricken vehicle but apparently Magnus has other ideas, missing completely and destroying the poor tent. Oh the humanity! Disembarking once again, Da Kaptin charges Mol and after a struggle takes him down with a heavy blow to the head. One lump or two? With only the Seeker and a lone Snaga left on the board, the muties have had enough, they decide to cut their losses and bottle out. They may scare easily, but I suspect they’ll soon be back, and in greater numbers.. In the post game sequence Mol was found to have a headwound from the bludgeoning he received, but he wasn’t disheartened. Quite the opposite, it seems to have knocked some confidence into him, enough to challenge Magnus for leadership! Ultimately Magnus proved to be a better shot, but it took several rounds to establish who was better. The mutie Keeper, Commissar Statistix, also ended up with a headwound. That could be an issue in future..
By comparison the mutie mob had an uneventful time, as Da Cuttas Ov Da Jibb may have won, but that wasn’t enough for the first mate. He wasn’t in the battle, but he did get to go in for a spot of serjery, emerging with tracks instead of legs and a steel skull. The increased leadership this gave him made him challenge Da Kaptin for command, a pitfight which he won. Da Kaptin ended up in Da Dok’s Serjery too afterwards, finding himself the proud owner of a gyro-stabilised monowheel, even though his old legs were just fine. Once the parts from MaxMini arrive there’ll be some fresh bionik orks on the table, no waiting around! 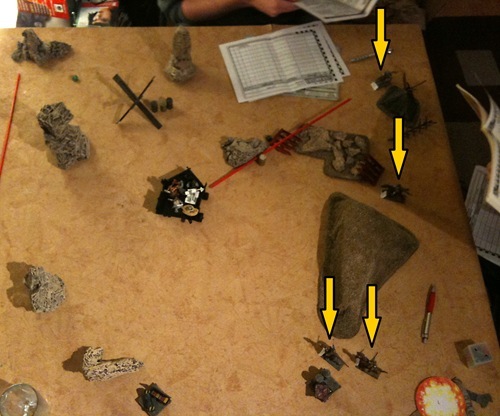 This entry was posted on Thursday, February 25th, 2010 at 23:32	and is filed under Battle Reports. You can follow any responses to this entry through the RSS 2.0 feed. You can leave a response, or trackback from your own site. 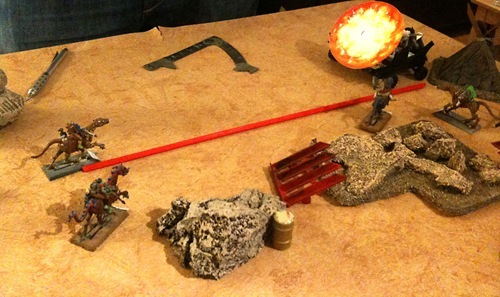 The most memorable part of the game for me is probably a tie between Da Kaptin emerging from the smoke, having just been the centre of the a mutie grenade, grinning in his Freebootin’ glory, or possibly Da Jolly Squig running aground. A mob that truly are both Orks and Pirates, especially as they still made it out with all the loot. A truly entertaining game. Some of the Ladz were in desperate need of some major serjery…and others thought they weren’t, but had some anyway. The first up was Grob, my (former) Furst Mate. He was severely injured as he had a leg wound (in both legs), a headwound and an old battle wound. But a couple of lucky rolls later, and he emerged from the Doc with Traks for legs, a steel skull and Fungus Bref Lungs. Fortunately, he was so injured that it didn’t really matter which serjery he had! But his steel skull went to his head (get it? 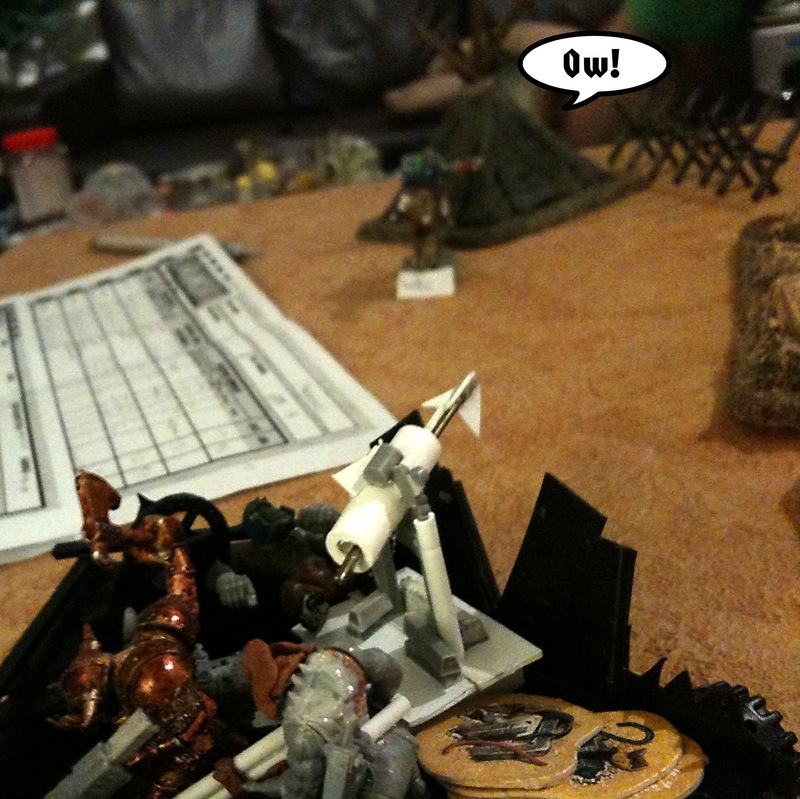 went to his head), increasing his leadership and pit fighting Da Kaptin for command of the mob…. So after the successful mutiny (which I’m still cut up about), Da Kaptin hung up his hat and revealed his true name…Carrudders, as he too went to the Doc. Unfortunately the Doc got a bit confused and even though he only went in with a headwound and one blinded one, he got a gyro-stabilised mono-wheel before the Doc remembered to have a go at the headwound as well, so got a nice shiny set of steel horns as well. Coupled with his Waaagh! ferocity skill that he gained after the game, as well as his liking for tickly grenade blasts, he’s shaping up to be fearsome foe…even if he’s no longer Kaptin. Steerrraaagh!, my driver already suffering from a legwound and old battle wound ended up in serjery too, receiving an Iron Lung. How fortunate, now his old battle wound won’t be playing up before a game. What use is a trukk, without a driver anyway?! Wabdash, my veteran of sorts received the Chuck from the muscle skills and Robba from the pirate skills, so not only might he be able to throw enemies about, but loot their corpses too! 2 fights and 2 losses for the Questers but they won’t let that stop them. My personal favourite moment was when the grenade shot went wild and took out the poor innocent tent who only JUST avoided getting run over earlier. The Cutters ship beaching itself was a close second though. It had to be pirate ship that beached itself, not the other trukks! I suffered a bit of mutiny from Mol who got a bit too big for his boots and tried to have Magnus in a shooting contest. Of course, there’s a reason Magnus won. Turns out it’s near impossible to miss a small target when your only weapon counts as having a BLAST RADIUS! 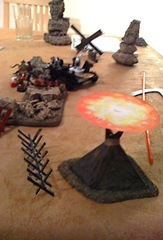 Baccus is compensating for the death of his brother by using rocks and scenery to his advantage and now thanks to rising another rank possesses both Hit N’ Run and Practiced Marksmen, meaning he can run 8 inches, fire a shot at a helpless enemy and then dash away another 8 inches to safety, all without penalty. Gotta love it.